All Badge Kickstarter Rewards Sent!!! With the exception of one or two stragglers, all of the Kickstarter Rewards for Badge have been sent. This means, if you have a reward coming, it's on its way. If you have a reward coming and you don't get it in a week or so, do let me know and we'll rectify it. This also means that the monster of Badge is out of the cage. It only took seven years. For those of you getting Badge as a reward, the best way to let me and the world know what you think of it is by reviewing it at your blog, at Amazon, at Goodreads, or anywhere else on the web. (Don't worry; I won't miss it.) 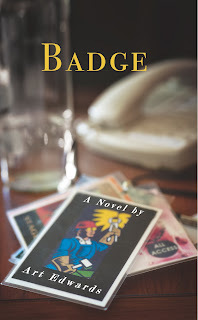 Amazon and Goodreads both have pages already set up for Badge, and I'll soon have some kind of Badge Facebook page as well. Perfect for linking! That's it for now. Enjoy the rest of the holidays, and I'll have lots of Badge news for you beginning next week. One final essay from me for 2013. It's about getting crushed up front at an AC/DC show in 1985. This is a review of the Future Tense edition of the title, which came out earlier this year. Have at it. If there's one thing my writer's group Writers Anonymous doesn't tolerate, it's boring writing. Every Thursday night in Portland, I print my latest piece and head to one of the four or five rotating dining rooms where WA meets to critique each other's work. It became very clear early on that each piece I bring in had better not lag. I can feel the sighs of my fellow attendees viscerally, inwardly cringe at every stifled yawn. If I make it through my five or so minute reading with a sense that I didn't put anyone to sleep, I know I'm getting somewhere. This process has yielded two books thus far by WA members, both of which would make perfect Christmas reading. The first is Breakfast: A History by Portland Mercury food writer Heather Arndt Anderson. A book about breakfast? Yes, and one that is engaging and urbane and fun. Heather has a knack for writing about food, and this book oozes like a broken egg yoke with her wealth of culinary knowledge, witty asides, and delicious quotes from days of breakfast yore. If you don't this book, I'll eat beef tongue for breakfast for a month. And Heather is speaking tomorrow night at the Jack London Pub on Riot Grrls in 1913 Portland. Go see her! The second book is God is Disappointed in You by Mark Russell. You know what the problem is with the Bible, besides it having more baggage than a cross-country TWA flight? Its wealth of wisdom is buried in verbiage that can be abstruse, and all that begetting and begetting. Come on, get to the point. This is a shame, because the Bible has more value than any other work of literature I've ever read. Mark Russell sets out to cure this weighty text of its encumbrances and give us only what's beautiful, riveting, relevant. Within GIDIY, each book of the Bible is reduced to two or three pages, and each is revitalized by Russell's wit and the pen New Yorker cartoonist Shannon Wheeler. You will laugh. A lot. If you don't like this book, I'll eat myrrh. And if you don't believe me, believe the trailer! Plenty more will come from this talented group of folks, so don't fall behind now. Buy and read Breakfast: A History and God is Disappointed in You. You will not be disappointed in you.